“You have a big day ahead of you,” says the man with the yellow hat before he drops George off at school. (You’d think after all these years, he would’ve learned not to leave the monkey alone!) George is a “special helper” for the children, holding books up at story time and letting the children practice counting on his toes. “And at recess George made sure everyone had a ball,” the text explains — as an illustration shows George tossing 10 different balls to the children. But soon George has made a mess with the paints, and he ventures off on his own to find a bucket and mop. 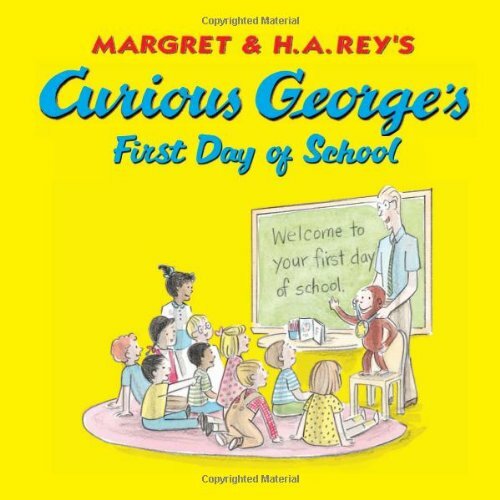 A janitor chases him, and George spills water onto the classroom floor — right in front of the school’s principal. “[P]oor George. He felt terrible. Maybe he was not such a good helper after all.” But the children all liked George, and pitched in to help clean up the mess. Unfortunately, that’s the end of the book. It’s half as long as the original stories written by H. A. Rey, and that eliminates the wild escalation that George’s adventures always used to have. For example, in “Curious George gets a Job,” the monkey steals spaghetti, then gets hired as a window washer, then gets chased down the fire escape by some painters and winds up in the hospital — before appearing in a movie. And in the original “Curious George,” he’s captured from the jungle, falls off a boat, phones a false alarm to the fire department and ends up in jail — before floating away in a bundle of stolen balloons. But in this story, there’s just one adventure. George goes to school and spills paint (and spills water cleaning it up). I wonder if the series would’ve been this popular if the original stories had been this short! Instead, the original adventures sold 30 million copies. But some critics have argued the stories need to be revised as the world starts to change. In the original 1941 story, “Rather than an eco-tourist, the Man in the Yellow Hat is a gun-toting poacher,” wrote the Wall Street Journal. Maybe we should be glad that in 2005 — the monkey is simply helping out at an elementary school!